PONS is a free advanced English to German dictionary app for Windows 8 that lets you translate English words to German in a just a couple of clicks. The good part is that you can jump from one language to another. For example: along with translating from English to German, you can also translate German words to English within a couple of clicks. By default, the translation has been in English to German mode. Now, to translate a word from English to German, just type a word in the “Search” bar given at the top left side. As you start typing a word, it will quickly bring you the meaning. You do not need to press enter key to get the results displayed. However, if you want to change the mode to German to English, just click the right mouse button anywhere on the screen. Now, click on “? ?” sign given at the content menu. One thing I liked about this German Dictionary app for Windows 8 is that, the app brings you the meaning and other possible info about every word you have on the screen. Yupp…You click on any word from the entire text, it will display the meaning of that word quickly. This way you can go deeper and deeper to search for each word you are confused of. In addition, you can also view words history that you have looked the meaning of. This feature makes it easier for you to remember what all have you searched so far. 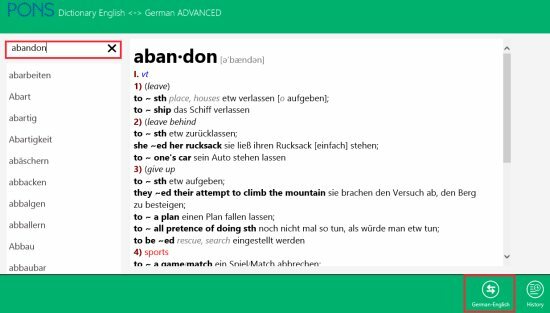 In short, this German dictionary app for Windows 8 is a good utility Windows 8 app to learn German words right on your Windows 8 desktop. Go ahead and download PONS available under the Books & References category in Windows 8 store.